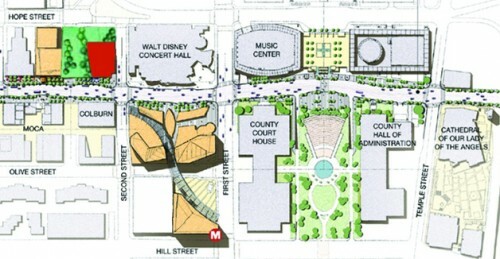 Map of LA's Grand Avenue; the new museum is colored red. When Diller Scofidio + Renfro were solicited last June by Eli Broad to sketch an idea for his new archive and museum, the architects were forced to ask: “What do you build next to Disney Hall?” Answer: Something else. Where Frank Gehry’s work is smooth and impenetrable, the Broad Art Foundation is porous and accessible. The stainless steel concert hall reflects the city’s skyline; blinding sunlight bounces off its capering shell. The Broad’s concrete veil, by contrast, is a less aggressive spectacle. At three-feet thick, and punched through with large angular openings, the new museum looks as if it is cloaked in an ice cube tray twisted by a powerful algorithm. As, certainly, it has been, to pleasing effect. Over time the animated, if a bit too-tidy white box, with its dramatic, carved out entryway – a quote of Diller’s earlier Alice Tully Hall – will settle onto Grand Avenue, a signature building poised not so much to duke it out with Disney as to hold firmly its own ground. The trouble here is that everyone – architects, planners, civic officials, and developers – is convinced that if you plant the right number of monuments on Grand Avenue, the street will become, as Eli Broad says, “the Champs Elysees of Los Angeles.” What they’re looking for is a sidewalk lined by masterpieces. No amount of architecture will transform Bunker Hill – the nation’s longest-running redevelopment project (some would say scam). Broad’s obsession with having architects strut their stuff has obscured the need for a considered response to the city itself— with varied program and a welcoming streetscape—not one street-top civic center. This is not to argue for provincial architecture. But it might be helpful if what goes up on Grand Avenue were considered in its rightful place and not as some moon-shot projectile intended to rescue or restore or resuscitate a barren landscape. For starters, the hill itself is – as it has been elsewhere – trampled, converted into a 3-story garage, as if the slope were actually flat. Why have the architects decided to essentially level a site that drops 200 feet from front to back? An inner truth – not to mention a particular history of human occupancy – resides in this steep hillside, yet the topography is buried. Does this geography communicate no ideas that might be captured in a building and, ultimately, speak to the city at large? And if Los Angeles is truly the center of contemporary art – as Broad and others argued at the unveiling of the museum’s design – why doesn’t the new building reach for a language that breathes the gritty, somewhat toxic perfume that spurs art here. As it is conceived, the Broad is a pleasant museum, with an admirable lobby, an exciting gallery space, and an eye-catching skin, suited to any philanthropist with $130 million to spare. As usual, Los Angeles gets the architecture of anywhere, leaving us to wonder where our city really is and who has the guts to confront it. 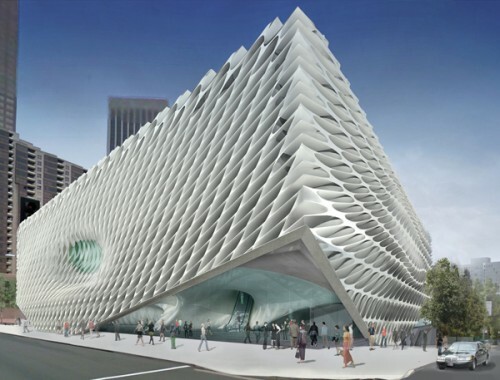 Rendering of The Broad, as the museum will be called.